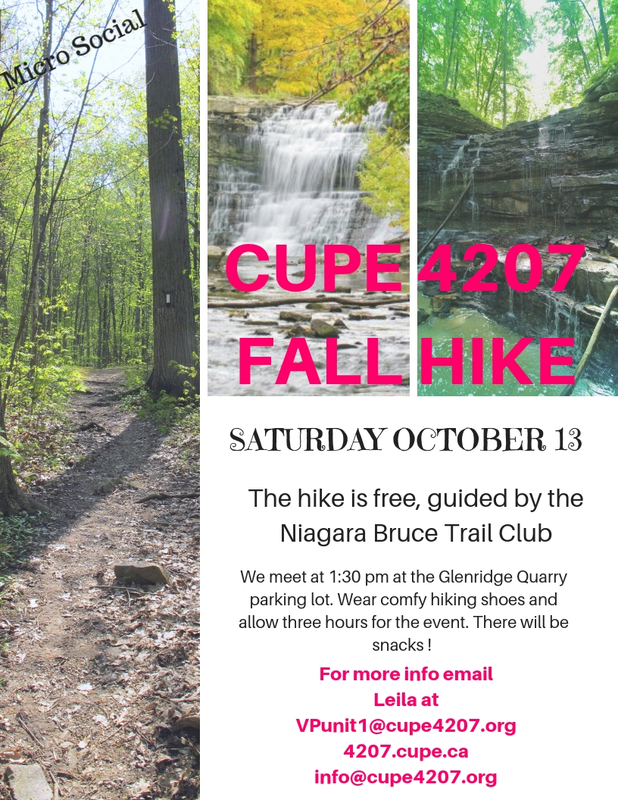 This CUPE 4207 Micro Social is lead by volunteers the Niagara Bruce Trail Club. We will share the many joys of hiking. We will learn how to prepare for a hike; about any safety issues that might be involved; what to bring on the trail; and the different types of hikes offered in Niagara. This workshop will begin with a 15 minutes presentation and question-and-answer period, followed by a two hours hike on the trails around Brock. We will get to enjoy the beauty of the different fall colors. There will be fun and education and fresh air. What an awesome way to relax and socialize! Participants must wear sturdy comfortable walking shoes and clothing appropriate for the weather. All participants will be given a hike-friendly snack and water, space is limited so hurry up to register and don’t miss the opportunity to hike with the professionals of the Niagara Bruce Trail Club. Participants must register for this event so we know how many participants will e joining us (also to know how many snacks & water to bring). There is no cost associated with this social.